An exercise electrocardiogram (Stress Echo) is a test that checks for changes in your heart while you exercise. An echocardiogram is an ultrasound of your heart. This test combines an ultrasound of your heart and a stress test. The purpose of this test is to compare the images of the heart muscle before and after it is stressed. Please do not eat anything 2 hours prior to the test. You may have juice or water at anytime. Diabetic patients may have a piece of dry toast and some fruit prior to the test. Take your medications at your usual time. Please bring a list of your current medications, as you may be asked for it. Wear comfortable footwear appropriate for brisk exercise on a treadmill. No boots, heels, sandals or flip-flops. Wear comfortable clothing appropriate for brisk exercise on a treadmill. No skirts or dresses. Family members are allowed to accompany you to the test, but are restricted to the office waiting room. Please shower prior to your appointment to reduce the spread of bacteria to our equipment. No lotions or body creams should be used on the day of testing. Deodorant is OK. Your total test time will vary, but usually takes approximately 1 hour. 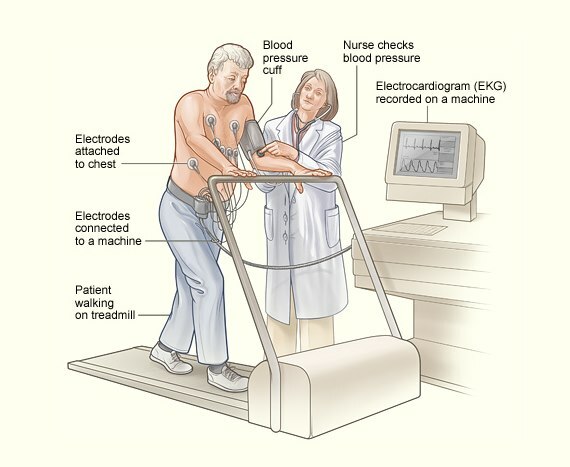 Exercise time on the treadmill will vary from patient to patient.